The sticker prices, before adjusting for remaining feature differences. Usually these are the numbers you will see on the window stickers. Models in short supply often sell at or even above these prices. While we strive for accuracy, the site is not error-free, and prices can change at any time. Want to find out how much dealers are willing to discount this car? 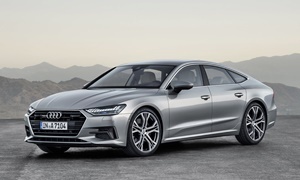 Request free, no-obligation Audi A7 / S7 / RS7 dealer quotes from dealers using our car quote form. The process is easy and takes just a minute or two. You'll receive price quotes from local approved dealers within 48 hours. See more details about Audi A7 / S7 / RS7 features. See more details about Audi A7 / S7 / RS7 specs. We're so sorry! Tell us how we can improve it. See TrueDelta's information for all Audi models.